Chatswood Croquet Club – Welcome to CCC! 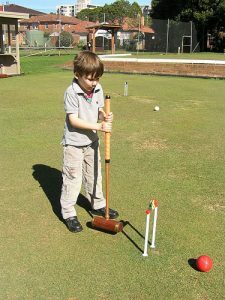 If you have thought of taking up a new sport, why not visit Chatswood Croquet Club? Our club is located close to the railway station a few minutes walk from the centre of Chatswood. Chatswood is one of the Northern Suburbs of Sydney about 15 km from the CBD. We have three excellent full size grass courts in an attractive location, surrounded by trees and shrubs. Our friendly Club consists of about 70 members of all ages, men and women, ranging from complete beginners to players of state standard. New members are always welcome. The Club plays both Association and Golf Croquet. Association Croquet is played on the Club roll-ups on Monday, Tuesday, Wednesday and Saturday mornings. Start time is 10.00 AM. Visitors are always welcome. Individual matches can be arranged at other times except when lawn maintenance is taking place. Golf Croquet is played on Monday, Wednesday and Saturday afternoons starting at 1.00 PM. Whites, creams or casual clothing are all welcome. Flat soled shoes must be worn. Lawn fees are $4 per day for members and $5 for visitors, who can also borrow club mallets for no charge. So, come along to CCC and give The Queen of Games a try!